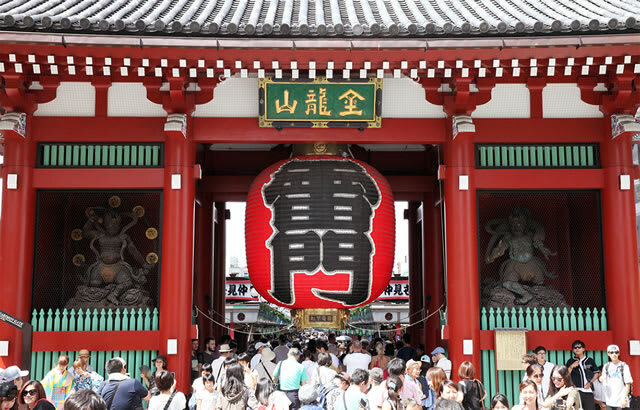 In Asakusa, there are more than 150 temples & shrines. There are many variations, for example small, big & famous and so on. We’ll let you know the places which you should pay a visit. Tombs of celebrities, historical constructions and many other famous places. Let’s check them out! When you go to Asakusa, you should go to浅草寺(Senso-ji Temple). 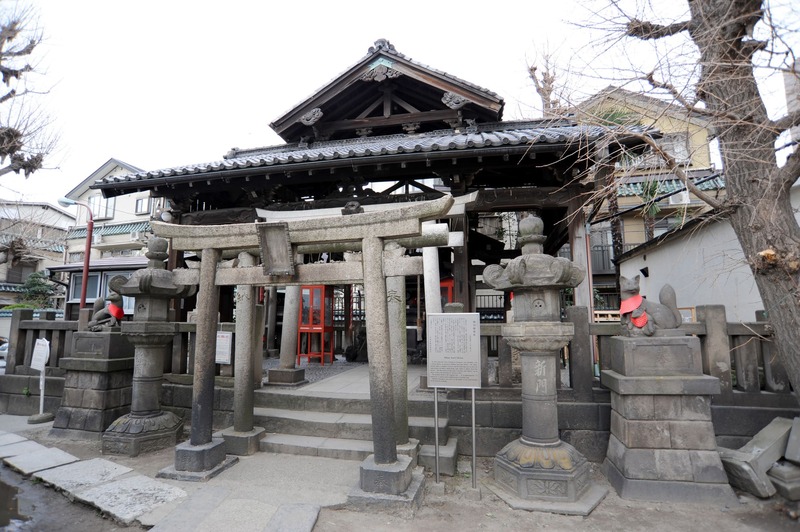 The historical about 1400 year old temple is the oldest one in Tokyo. Formerly associated with the Tendai sect of Buddhism, it became independent after World WarⅡas Shō Kannon sect. This temple is one of the 10 most popular temples/shrines during New Year 初詣hatsumōde (the first shrine, temple visit of the year). There are so many spots to see at Senso-ji Temple. One of them is雷門(Kaminarimon / Thunder Gate ). On the gate, you see the statues of the Shinto gods. Fūjin on the right side and Raijin on the left side. Official name is風雷神門（Fū Raijin Gate / God of wind &thunder Gate）. But everyone says “Kaminarimon / Thunder Gate”. 本堂 Hondo (Main hall) is also nice to visit. Before make a wish, you’d better to say your name and address. So that your wish might come true. Besides you should walk the edge of road approaching the temple. Because in the center of the way is for God or Buddha. A street on the approach to the temple , there is shopping street called仲見世(Nakamise) . On the east side there are 54 shops and 35 shops on the west side. You can buy there souvenirs, Japanese sweets and snacks. Go visit the temple and let’s enjoy delicious snacks and take a walk. In Asakusa, Senso-ji temple is famous. But near the temple there is a shrine 「浅草神社(Asakusa Shrine)」. It also called三社様（Sanja sama）. It’s constructed in order to honor the three men who established and constructed the Sensō-ji. 土師真中知（Nakatomo, Haji no Atai）、檜前浜成（Hamanari Hinokuma）、武成（Takenari,）. 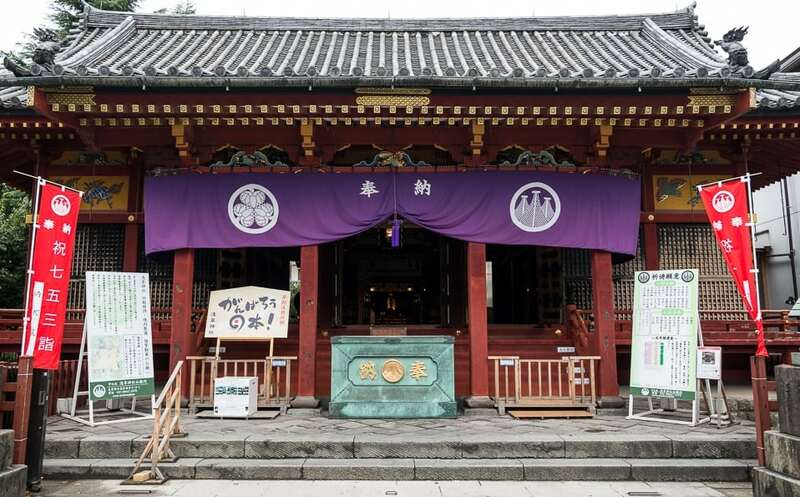 Sanja Shrine has a long history. The enshrined people couldn’t be upper class. Till the end of Edo period, it was seen just like one of Senso-ji Temple. Due to the separation of Shinto from Buddhism during the Meiji Period, Asakusa shrine became independent from Senso-ji Temple. To worship徳川家康 (Ieyasu Tokugawa) and大国主尊(Ōkuninushi no mikoto). 三社Sanja (Three Men). Later it changed the name to Asakusa Shrine. You should visit本殿 Honden (Main Shrine）拝殿Haiden (Hall of Worship）　which were constructed during Edo period. They were designated an Important Cultural Property by the Japanese government in 1951. The great constructions and the pictures of鳳凰（Ho-Oh）、麒麟（Kirin）、飛龍(Hiryu) worth to see. The origin of the name is unknown. 被官(Hikan) means官を被る(Kan wo komuru ). The name has a relation to getting a job and a career advancement. This shrine was built in 1855. Architectural style is一間社流造.(Ikkensyanagaredukuri). There is a mini shrine with a roof made of sugi (bark) and still original. The shrine is 1.5 meters wide and 1.4 meters deep. This valuable mini shrine was protected during the big earth quake of 1923 and during World War II which it both survived. In 860 須佐之男命Susanoo-no-Mikoto (name of a god) worshiped as the local guardian Kyodo Shigoshin , noble shrine. It’s one of the oldest shrines in Tokyo. 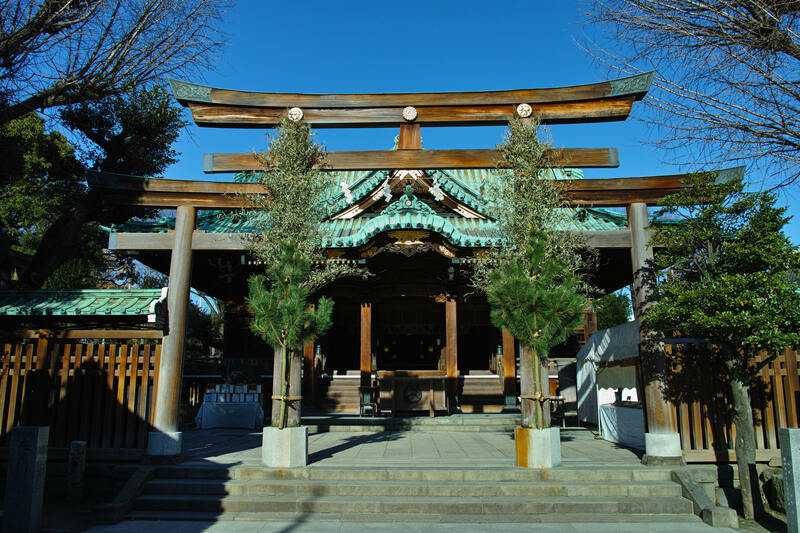 The shrine is located next to Sumida Park – The gardens of the former Mito Tokugawa clan residence – and made of a hinoki tree construction. The carving of the shrine is a wonderful piece of art. – God of Cows. The shrine carries a cow character as a religious symbol. 「撫牛(Nadeushi / Stroke cow)」. The belief is that when you stroke the cow at the same place where you have pain it will be healed. Usually at shrines they use “Komainu” (guardian lion-dogs) guarding the entrance, but here they use cows. That is unique. It consists out of one big gate adjacent by two smaller gates. The origin of this gate is unknown. This shrine is located not so far from Tokyo Skytree. 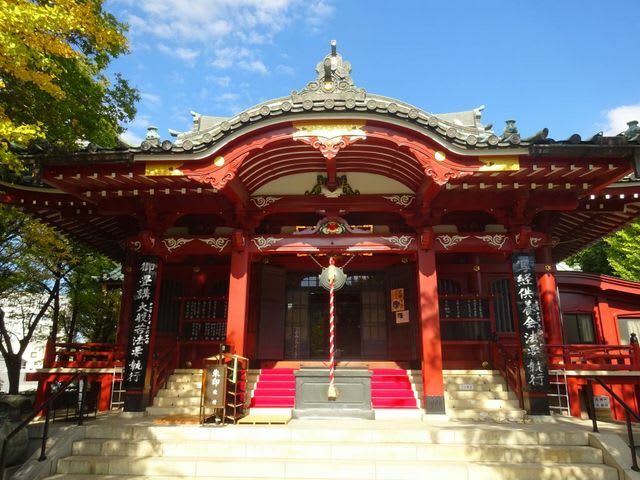 You can visit this shrine as a part of your Tokyo sightseeing. 東本願寺 Higashi Hongan-ji Temple, one of 浄土真宗 Jōdo Shinshū is a temple which is located at Nishiasakusa Taito-ku. The temple was built by徳川家康 Ieyasu Tokugawa. Befote this temple was located in Kanda. After several fires they replaced the temple to Asakusa. There are many grave stones located at this temple. After 1711 the temple was a dormitory for Joseon (Korea) missions to Japan. There are pictures drawn on fusuma (papered sliding door) by famous painter 棟方志功 (Shikō Munakata) at 紫雪亭 Shiuntei . In 1961, he has painted in total 28 pieces. These are the treasure of Higashi Honganji Temple. At慈光殿(Jikoden) which has built for memorial of 750 years death anniversary of親鸞聖人Shinranshonin (the founder of Jōdo Shinshū sect in Japan), there is a gallery, a tea room, a multipurpose room. Four times a month, mainly on Sundays there are calligraphy and ikebana (Japanese flower arrangement) demonstrations held at this temple. A wonderful place to experience Japanese tradition at this temple. 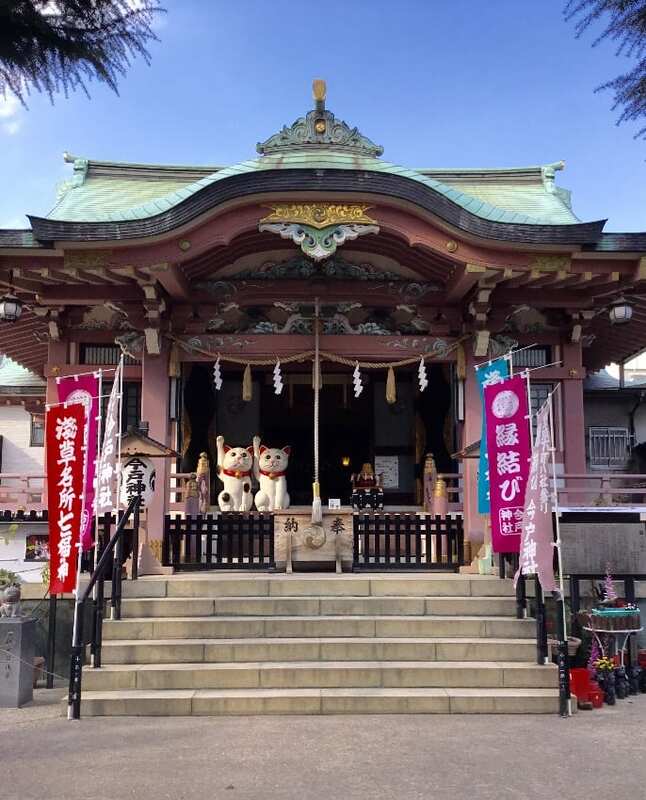 Imado Shrine, worship いざなぎのみこと(Izanagi no mikoto) and いざなみのみこと(Izanami no mikoto) who got married as the first in Japanese mythology. These two Gods gave birth to the many islands of Japan, and it’s the origin of numerous deities of Shintoism, mountain, sea, and plants. They were respected as a産霊 Musuhi – spontaneous generation. That’s why this shrine is such a popular spot among young women who want to get married. The shrine has huge lucky cats, and shuin book –well known for it’s books for seal stamps given to worshippers. You can see many lucky cats at this shrine. Besides the place is known as沖田総司 Sōji Okita from “Shinsengumi “ died here. 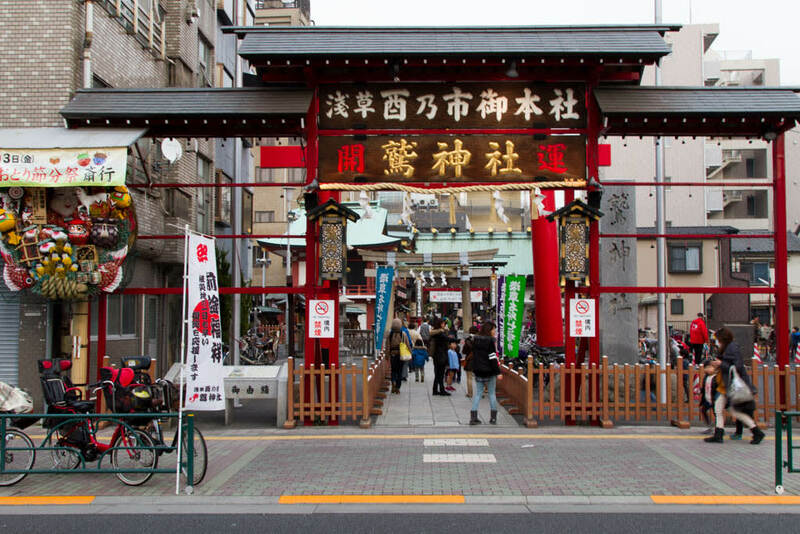 This location is one of the浅草名所七福神Asakusameisho shichifukujin (Seven Lucky Gods) in Asakusa, 福禄寿Fukurokujyu. attention to the temple itself related to the Seven Lucky God but also visit all those other places around and wonder yourself going back to Edo Period. 鷲神社（Ohtori Shrine）is a historical shrine dedicated to 天日鷲命Awanohiwashinomikoto and日本武尊 Yamato Takerunomikoto . 天日鷲命（Awanohiwashinomikoto）is a God which pioneers land. So by this it’s respected as a God for Good Luck, the increase of production and the profit of business. In November, celebrate 酉の市Tori no ichi festival. 酉の市Tori no ichi is a festival held thanks to the God for Good Luck. The participators receive blessings for a profitable business for the coming year. At鷲神社Ohtori Shrine, they have special charms called熊手御守 Kumadeomamori. These charms bring good luck and success of business and it’s given during 酉の市Tori no ichi festival. Kumade(rake) is said that bring good luck and an avatar of God. It’s often named as かっこめ “kakkome” はっこめ “Hakkome”. During this festival there are many market stalls around there. The dates of the festival changing every year but always in November. Check the date and be blessed by good luck during this festival! 浅草待乳山聖天（Asakusa Matsuchiyama Shoden） belongs to 聖観音宗(Sho-Kannon Sect which is a branch of the Tendai Sect of Buddhism.) Official name is本龍院(Honrhuin). It is said that during the period of Empress Suiko，the mountain suddenly raised itself from the earth, then a golden dragon appeared and protect it. Six years later when the land was suffering from a severe drought, Eleven-Faced Kannon mercifully perceived the hardships of the people，and appeared in the form of Daisho-Kangi- Ten to deliver immediate salvation. This is said to be the origin of the seating of Kangi-Ten on this mountain. You see many daikon (Japanese radish) and pouches in various places of the temple. Daikon shows health, live long in harmony with one’s spouse and other family members, and to find a suitable candidate for marriage. A pouch is seen as a symbol of prosperity in business. Yokuyu (oil-bathing) ritual is the most sacred ritual to honor. It offers every day in Matsuchi Yama to pray for the prompt fulfillment of all the wishes of the believers. The temple accepts requests for Yokuyu anytime，and a seal or an amulet relic is awarded after the ritual is practiced for seven days. Visit Asakusa Matsuchiyama Shoden to receive power!